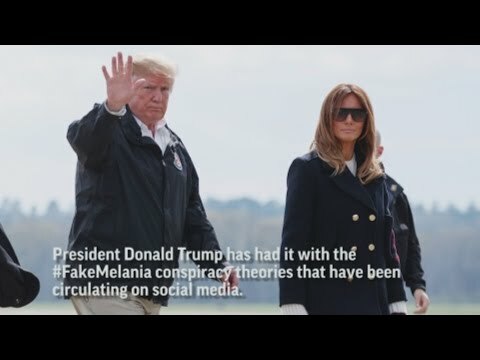 WASHINGTON (AP) — President Donald Trump is not amused by the #FakeMelania conspiracy theories circulating on social media. He spun off a new theory on Wednesday to debunk the idea that there’s a body double of his wife who steps in for her at times. The “fake news” did it, he claimed without evidence. Trump alleged on Wednesday in a tweet that photos of his wife had been altered to make them appear as though a look-alike accompanied him to Alabama last week to survey tornado damage. His favorite morning TV program, “Fox & Friends,” reported on the body-double theory Wednesday as the show’s hosts weighed in on a discussion that aired Monday on ABC’s “The View.” Hosts of the ABC program debated whether an impostor had traveled with Trump. Hosts of “The View” had commented on how the woman at Trump’s side in photos of the trip appeared shorter than usual and had a different facial structure than the first lady’s. One host allowed that the first lady might have been wearing flat shoes. In fact, the 5-foot-11 first lady had ditched her customary stilettos for sneakers to walk around the rough terrain with the 6-foot-3 Trump. The White House did not respond to a request for comment on who specifically Trump thought had doctored the photos. The president showed his frustration with press coverage of his wife during an interview this week with a conservative online news organization. “If our first lady, if I were a Democrat instead of a Republican, she’d be Jackie O times twenty. Instead, they go after her,” Trump told Breitbart News in Monday’s interview. Trump was referring to President John F. Kennedy’s wife, Jacqueline Kennedy Onassis, who often was referred to as “Jackie O” after she remarried following Kennedy’s assassination. Several factors can influence the way people appear in photos, including the angle at which the photos are taken, the type of camera lens that is used and the positioning of the photographer, said Akili Ramsess, executive director of the National Press Photographers Association. News images are not to be altered beyond basic toning and cropping, she said. The “FakeMelania” hashtag has been around since at least 2017, Trump’s first year in office, with Twitter searches producing numerous photos of the first lady and unfounded commentary that the woman in the images is not Melania Trump.